Automakers are taking away spares that are used to solve problems like this. Be proactive about flat tires with nitrogen tire inflation. Automakers are now opting for tire repair kits and run-flat tires instead of spare tires, saying this move will increase fuel efficiency, reduce weight, lower costs, and conveniently leave consumers with more room in their trunks. According to a Los Angeles Times review of data and specifications, about 13% of the more than one million vehicles sold in the U.S. did not offer an extra tire as standard equipment. And that’s just in the last month. AAA expects 1.2 million people will call for help this summer. Many will be flats, but the agency says that many of those could be avoided if people took care of their tires properly. 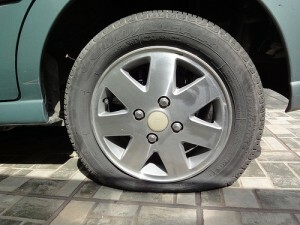 Flat tire roadside assistance increased 2% last year after declining for many years. Local AAA officials said they did not know the reason for the increase. Why wait until a flat tire or a blowout to realize you don’t have a spare tire? Something you can do right now to prevent yourself from being one of those 1.2 million people is to give your tires a tune up with nitrogen tire inflation. Having nitrogen in tires maintains proper tire pressure for a longer period of time, serving as better protection against those blowouts and flat tires. Putting nitrogen in tires also turns them into hybrid tires, extending the life of the tire and additionally increasing the fuel efficiency of your vehicle (along with the absence of a spare). If you are considering this option, a great nitrogen tire dealer is Nitrofleet99. If you are one of those people who likes having the spare tire, they aren’t completely going away, yet, Some automakers are offering the option of a spare for an additional charge. If you have a spare, or are opting for the spare, make sure it retains its proper tire pressure like the rest of your tires with nitrogen tire inflation.